Epidemiological and animal studies suggest an association between dietary fatty acids and an increase risk of developing breast cancer. Obesity, which is characterized by hyperlipidemia and an elevation of circulating free fatty acids (FFAs), is also associated with enhanced cancer risk. 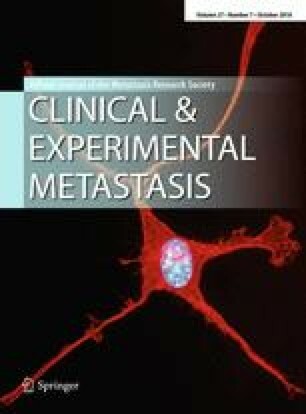 In breast cancer cells, the FFA oleic acid (OA) induces migration, proliferation, prolong survival, invasion, an increase in cellular Ca2+ concentration, MEK1/2, ERK1/2, FAK and Src activation. However, the role of OA on MMP-9 secretion and invasion has not been studied in detail. We demonstrate here that stimulation of MDA-MB-231 breast cancer cells with 200 μM OA induces an increase on MMP-9 secretion through a PKC, Src, and EGFR-dependent pathway, as revealed by gelatin zymography assays. Furthermore, microtubule network mediates MMP-9 secretion induced by OA. In contrast, OA does not induce an increase on MMP-9 secretion in MCF10A cells, whereas it does not induce MMP-9 secretion in MCF12A mammary non-tumorigenic epithelial cells. In addition, OA induces invasion through an EGFR, Gi/Go proteins, MMPs, PKC and Src-dependent pathway, but it is not able to promote invasion in non-invasive MCF-7 breast cancer cells. In summary, our findings demonstrate that OA promotes an increase on MMP-9 secretion and invasion through a PKC, Src, and EGFR-dependent pathway in breast cancer cells. Adriana Soto-Guzman and Napoleon Navarro-Tito contributed equally to this work. The online version of this article (doi: 10.1007/s10585-010-9340-1) contains supplementary material, which is available to authorized users. We are grateful to Nora Ruiz for her technical assistance. This work was supported by grants from CONACYT (43370 and 83802). A. S-G is a recipient of a postdoctoral fellowship from ICyTDF. L. C-S, R. M-O and N. N-T were supported by a CONACYT predoctoral training grant.